First, a sampler. Now, a synth. Pioneer DJ, not content with essentially owning the DJ booth at this point, have their second production instrument in less than a year. It’s called the Toraiz AS-1. It’s an analog monosynth. It continues the collaboration with synthesizer legend Dave Smith. Price: US$499 or €549 suggested retail, including VAT. But mainly it looks as though you’ll dial up presets, then play along on the touch controls and sequencer while adjust filter and envelopes. 2 voltage-controlled oscillators (VCO) with continuously-variable triangle, sawtooth, and pulse wave shapes. One 2-pole, resonant high-pass filter. Actually, if they had just done that, I think it’d be a total failure. But the smart move here was to add Dave Smith’s effects, too – again from the Prophet-6. Bucket Brigade Delay, Distortion, Ring Modulation, Chorus and Maestro Phaser. Plus you get MIDI in and out, and – here’s Pioneer’s lock-in – Pioneer Link support. So you can plug it into a CDJ and sync to that. That’s the part that to me is, frankly, unnerving. 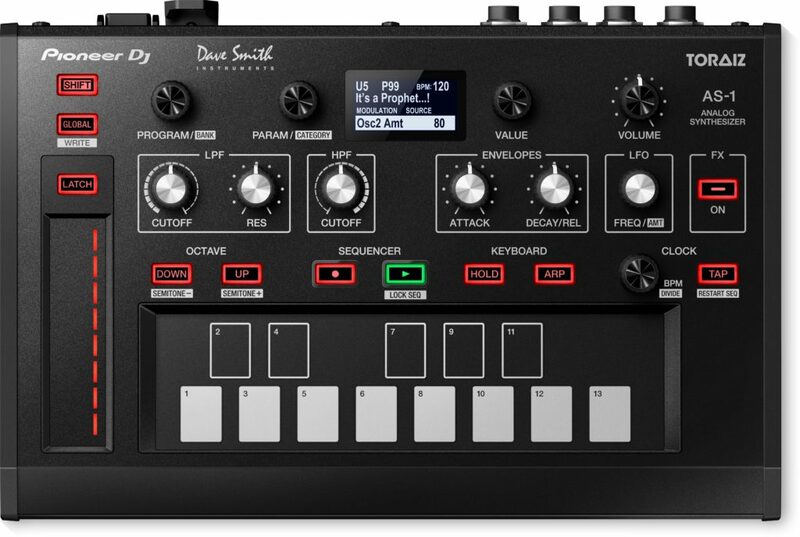 Pioneer can lock other synthesizer makers out of the DJ booth, and I don’t see how that’s terribly terrific for anyone. But, on the other hand, by letting synthesizers into the DJ booth in the first place, Pioneer may unwittingly create some demand for sync interoperability with its gear. Let’s watch. Make a basic two-oscillator synth, throw in some good Dave Smith filters and effects, and then make the thing easy to play and sequence – that sounds like a decent formula. Now if you’re wondering whether producers other than die-hard Pioneer fans will give it a go – I’m wondering that, too. I’d like to give it a tough test from both the DJ and producer perspective. Hope we can convince Pioneer to get CDM a review unit in a hurry.